Thank you for participating in campus consultations to develop the Asset and Campus Enhancement (ACE) plan. A "What we Heard" report has been developed and can be viewed/downloaded here. At the October 2015 State of the University Address, Dr. Annette Trimbee, President and Vice-Chancellor, formally unveiled the new Strategic Directions for UWinnipeg, developed through extensive consultations with UWinnipeg community stakeholders and approved by the Board of Regents. 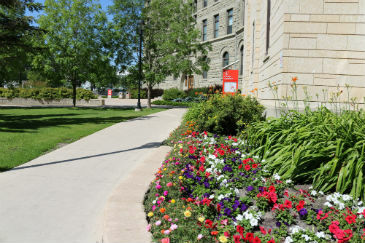 The Strategic Directions —Academic Excellence and Renewal; Student Experience and Success; Indigenization; Research Excellence, Knowledge Mobilization and Impact; and Financial and Institutional Resilience — are articulated in context in the document titled "Growing Leaders" which may be viewed in the related link to the left. We are moving in a direction that acknowledges and protects the core of our institution—those principles that have earned us a reputation as a post-secondary institution of excellence—while creating a resilient and stable foundation upon which to build our future. We are defining and achieving growth not in terms of student numbers, but in terms of outcomes, impact, and success. We are innovative, deliberate, collaborative, responsive, and thoughtful. Together, our Strategic Directions form a framework to guide our future decision making. Through 2016-2017,faculty,staff, students, and external stakeholders are providing input as we develop an interlinked Academic and Research Plan, a Strategic Enrolment Framework, a plan for Indigenization, and a Financial Resources plan that includes capital development. These documents outline our specific actions and metrics that will advance our strategic directions, made within the context of our proposed three-year budget. As these plans are developed they are posted on this site.